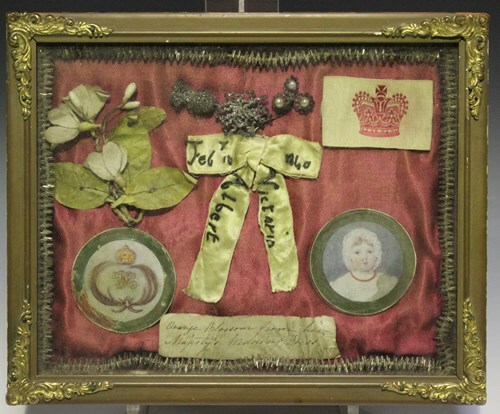 A group of royal related curios, including a dress adornment and a piece of paper inscribed 'Orange Blossom from her Majesty's Wedding Dress', the tied silk bow embroidered with 'Feb 10 1840 Albert Victoria', all mounted and framed as one. 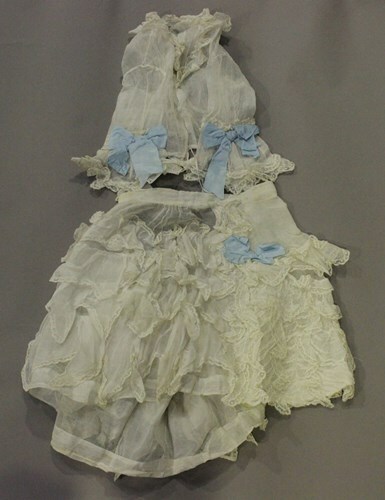 A selection of mainly 19th century infants' clothing, including a gauze and applied lace skirt with matching bodice, a cotton dress with embroidered decoration and light blue ribbon waistband, three bonnets and other dresses. 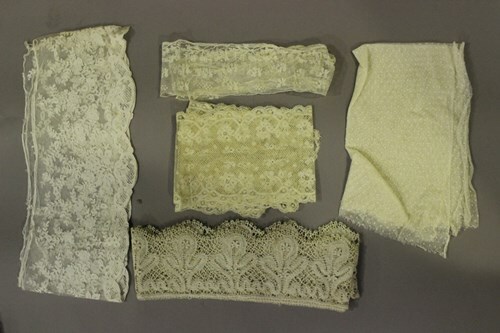 A group of mainly 19th century lacework, including headpieces, a pair of cuffs, various panels, borders and other sections. 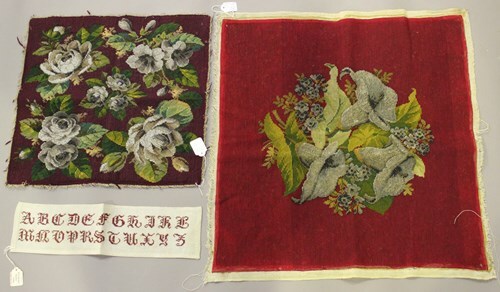 A group of mainly 19th and early 20th century textiles, including a bead and woolwork floral panel, other pieces of beadwork, samples of ecclesiastical vestments and embroidery. 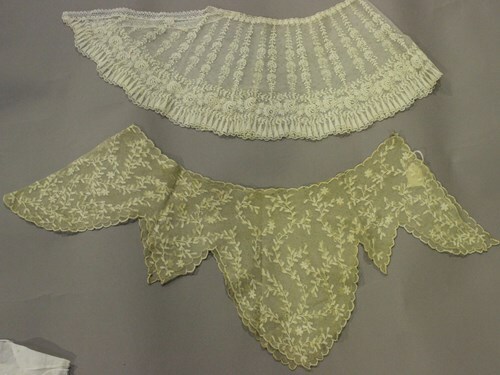 A collection of various 19th century and later lacework and lacework patterns, including collars, sleeves and other sections, examples of Renaissance, other tape lace and tatting, together with a selection mounted within a folder. 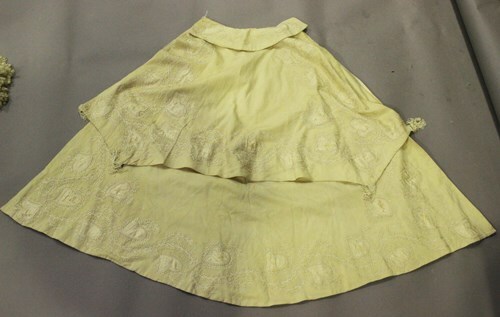 A Victorian cream fabric baby's tiered cape, embroidered in ivory silk with trailing foliage and silk hearts, together with another similar cape and a late Victorian silk and applied lace girl's dress. 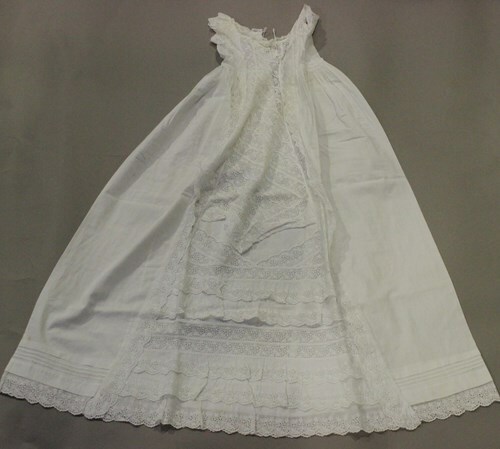 A good collection of mainly Victorian and Edwardian infants' clothing, including embroidered linen christening gowns, a cream silk dress with applied 'Forest Gate Collegiate School' pupil's label, day dresses, nightgowns, petticoats, capes and other dresses. 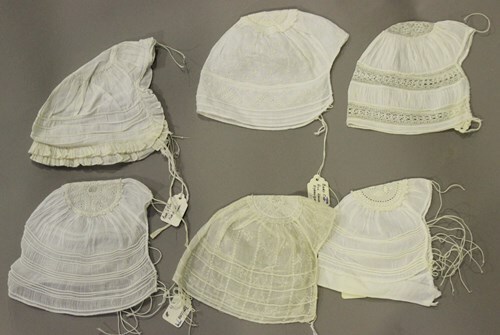 A group of fifteen mainly Victorian babies' caps, the majority with decorative lacework, including Ayrshire, crochet and silk examples, together with three ladies' caps. 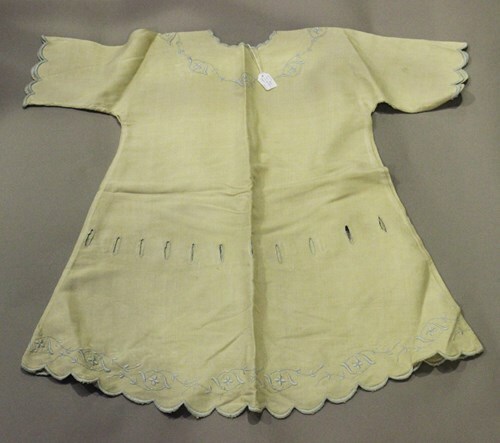 A collection of mainly Victorian and Edwardian linen clothing, including day dresses, nightgowns, petticoats and other undergarments, together with an early 20th century machine net and tape lace dress, a Victorian cream silk bodice and a peach silk skirt. 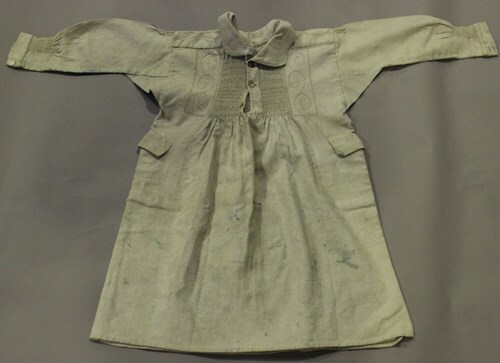 A late Victorian heavy linen boy's Sussex smock with gathered front and sleeves, length 77cm (some faults), together with an early 20th century cream silk and embroidered smock-style girl's dress. 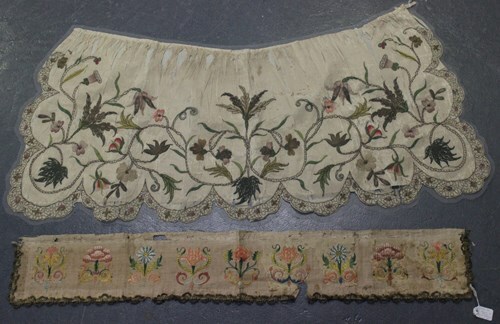 An early 18th century ivory silk apron of lobed outline, embroidered in metal thread and coloured silks with trailing tendrils, flowerheads and leaves, 46cm x 98cm, together with an early 18th century Continental silk embroidered ecclesiastical panel with gilt metal braiding, 14cm x 88cm. 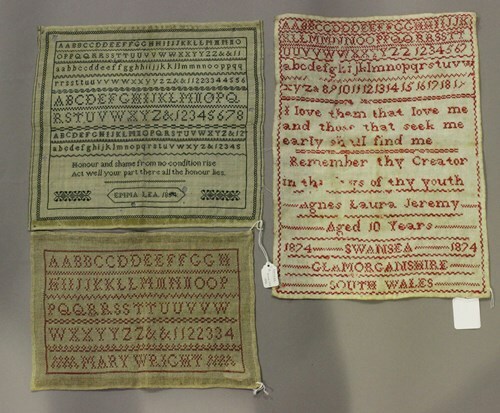 A Victorian Welsh sampler by Agnes Laura Jeremy, aged 10 years, dated 1874 and inscribed 'Swansea, Glamorganshire, South Wales', worked in red wool, 42cm x 29.5cm, another Victorian sampler by Emma Lea, finely worked in dark green silk, 31cm x 34cm, a late Victorian cream linen band sampler, dated 1882, 135cm x 23cm, and a small group of other samplers. 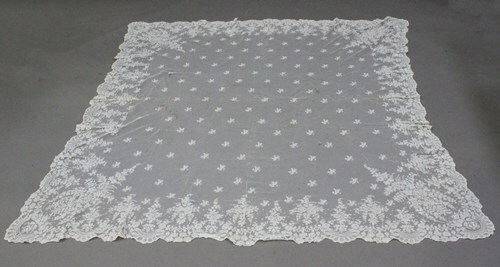 A late 19th/early 20th century Continental white net and lacework wedding veil with a foliate border and overall floral sprigs, 188cm x 162cm (some faults). 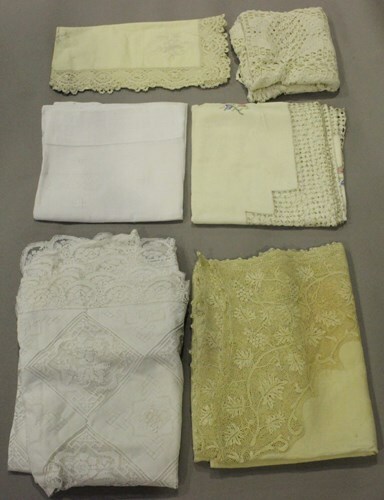 A small group of textiles, including an ivory-toned linen tablecloth with cellular lacework edging, 255cm x 160cm. 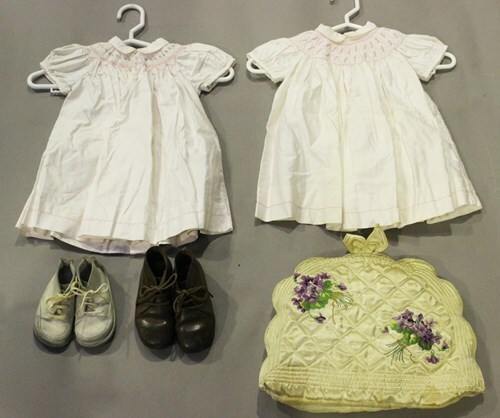 A small group of early/mid-20th century infants' clothing, including two pairs of leather boots, two cotton babies' caps and three girls' dresses. 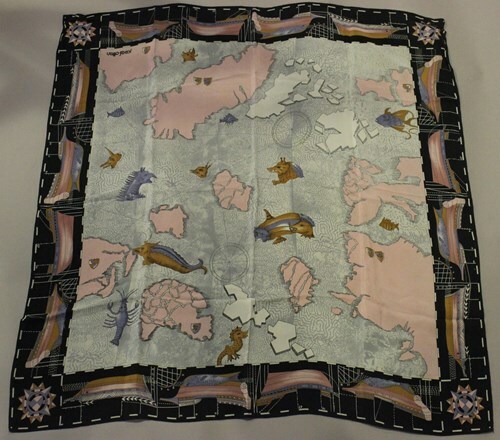 A collection of ten printed silk scarves, including a Josef Otten scarf, printed with a map and ships, and some replica designer scarves. 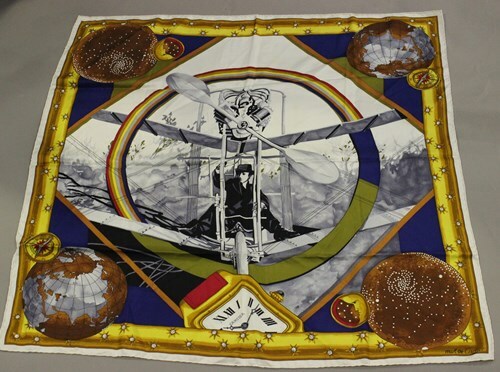 A group of three silk scarves, comprising a Must de Cartier scarf and two detailed 'Hermès', together with a Christian Dior gilt metal, colourless paste and cream enamel collar necklace. An early 20th century embroidered silk long band runner, worked in pink and cream silk with repeating leaf and wreath motifs, highlighted in gilt metal thread, 282cm x 16cm. 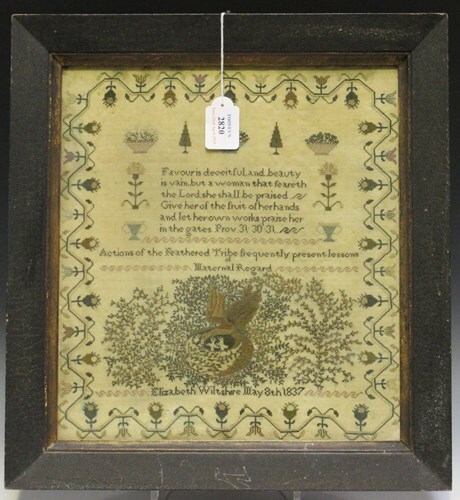 A George III needlework sampler by Mary Harding, dated 1808, the central verse surrounded by plants, birds and cherubs, within a strawberry border, 31cm x 30.5cm, laid on to a blue backing and mounted within an ebonized frame. 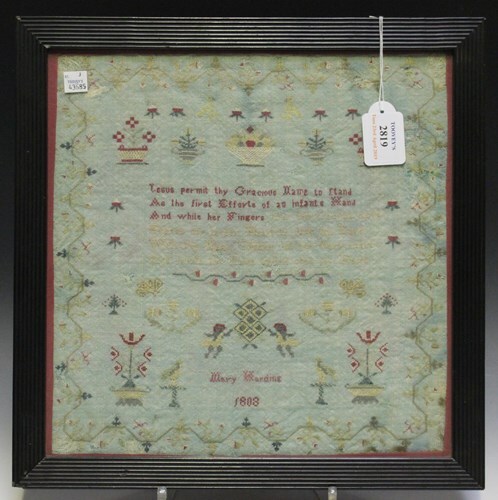 An early Victorian needlework sampler by Elizabeth Wiltshire, dated May 8th 1837, the central verse above a bird tending a nest with two chicks, within a flowering vine border, 35cm x 32cm, framed.